The Wire Association International (WAI), Inc. offers its Platinum Membership Program to recognize and reward organizations that actively support the Association by participating as exhibitors, advertisers, sponsors, or content providers for WAI-organized events, publications, and educational programs. Appoint five (5) of your staff as members of WAI. Each will receive full WAI membership benefits for a year including: Access to free educational webinars and all archived webinars; Free download of 5,600 technical articles; WJI Reference Guide; Wire Journal International magazine; Discounts on WAI products, services, and events. Receive premier, elevated placement of your company listing on WAI’s online Industry Search (a $250 value). 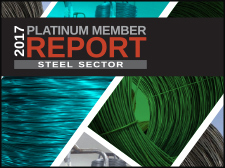 Also be acknowledged as a Platinum Member at WAI trade shows. Receive annual invitation-only presentations of market data in the form of an exclusive Platinum Member reception, a VIP roundtable discussion, webinar, or industry report. The standalone value of Item 1 is \(650. Platinum Membership includes items 1, 2, and 3 for \)595! Meet your peers. Achieve your goals. Join WAI today.